It took over a week, but my giraffe sculpture is finally finished. 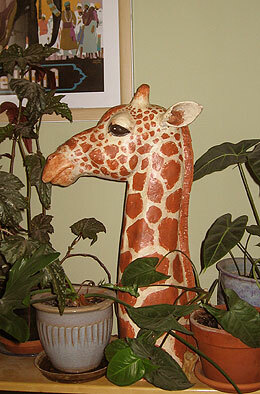 The neck was made with a cardboard armature (see the African mask tutorial). It took quite a lot of pushing, prodding, (and some wire “stitching”), to get the cardboard to behave the way I wanted it to. The process wasn’t pretty, and I won’t make you look at it. The head was built with two layers of paper and raw flour and water paste over a temporary armature of paper and Super Sculpey. To see how that’s done, check out the paper mache rabbit tutorial. The two layers of paper were strong enough to hold their shape, so I left the head hollow after removing the Sculpey. Even though the neck was weighted with plaster, I still needed the head to be very light so my cats can’t knock it over. The finished sculpture is 26″ tall, and the head is 15 inches long. I’ve been thinking about doing a giraffe for years, but I finally got excited about actually doing it when I realized there was a perfect spot for it on the shelf where I keep my large houseplants.Â A poster of an Indian elephant is above the shelf, and the colors of the poster nicely compliment the giraffe’s spots. And this got me thinking about a book I read last year. In The View From The Studio Door: How Artists Find Their Way In An Uncertain World , Ted Orland suggests that many art students give up on art as soon as they graduate from art school because they no longer have a “place” for their artwork. Students spend years producing work for their class critiques and a possible place in the campus gallery. Then, after graduation, creativity seems to dry up. Orland believes that creativity can’t flourish unless an artist can imagine their work sitting in a specific place after it’s finished. I know this has been true for me. Back when I made a living selling pen and ink drawings at the Pike Place Market in Seattle, I stopped drawing as soon as I had enough prints to fill my designated booth space. When I moved to Portland, I designed some paper mache animal dolls – but only as many as I needed for my Saturday Market display. And now I’ve only begun sculpting again because this website gave me an “excuse” to create. Once I was back in the swing of things, I found myself enjoying the learning process – pushing my understanding of paper mache as a sculptural medium in a way that I had not done before. 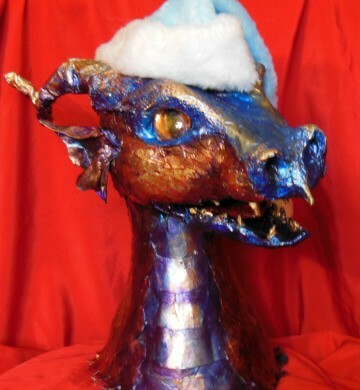 And the website gives me a place for my finished sculptures, even the ones like the dragon that I don’t really “need” in my house. But still, I find myself hesitating to create large items, even if I’ve thought about them for a long time – especially if they would be too complicated for a tutorial and therefore don’t really belong on this website. How can I, or any artist, get excited about creating something if we can’t imagine the finished sculpture sitting somewhere? How do people overcome this constraint? No artist starts out famous, with galleries or buyers begging for their work. So how does the beginning artist manage to make the paintings or sculptures or textile art – or whatever – without having a place to display them? So, do you think Ted Orland is right? If you’ve been stymied by “artist’s block,” was it because you didn’t have a place to put your artwork when it was finished? If so, how did you keep it from silencing your muse? Hi, I am not a working artist, but I have an outlet for my art in my club. I belong to the Sociey for Creative Anachromism or SCA. We recreate the world of pre-17th century Europe with visitors from other places. We have our events in schools and churches and outdoors. It is hard to believe that an armory is a medieval hall so be make things to decorate with. For example I do wall hangings. I have gotten into making things with paper mache. I got into it by studying Carta pesta. Many famous artist in the Renaissance use paper to cast their bronze pieces so they could be sold at a bargain. Many Museums boast of having these paper mache copies. Also sometime in the last part of the 1500 and early 1600 church figures were made out of cartapesta/paper mache. I have started making crests for helmets out of paper mache. This is a dragon I made for a chest but someone bought it just for decor. The green one was the crest and the reddish one the decor. I am also making heads for people to display their hats. I have a friend who do jewelry and she wants me to do busts of Henry VIII’s wives because she is recreating their jewelry. My club is always doing something artistic. We donated a tree for the Philbrook Museum in Tulsa. I live in Tulsa. We decorated it with Medieval art and in the process learned all sorts of things. Clubs like the SCA are all over the place and they are a great way to use your art. If you are not into Medieval you could find the Civil War group or the Edwardan groups. There is even WWI and WWII goups. I have no idea what they are called. Any of the history groups that recreate the periods they are studying have a need for period art. They are a great way to learn and be inspired. Interesting post, Willow/ Now I have to go check out that Carta pesta – I’ve never heard of it before. And what a nice dragon – how did you get the metallic finish? I didn’t stop making art after art school because of lack of ideas or ‘place to exhibit’. That has always been a minimal drive for me much to the dismay to the professors at MICA! My poor family has gotten so many handmade things over the years I am sure they are sick of them. Now I have three kids and have gotten a little overboard in theme parties for them. My almost 8 year old is having a Harry Potter party this year and I cam to your site to see your snowy owl which is wonderful. I have started to make one too! I have a similar challenge in my painting (I do a lot of pet portraits, often from less-than-perfect photos). One way to get the feel for expressions in your given beastie is to spend a lot of time with that kind of animal, to see what’s normal for them. Maybe harder to do with a zebra, but horses might be more readily available. Alternatively, once you understand the physiology from pictures as Jonni suggests, you could just anthropomorphize to your heart’s content. Depends on what your goal is. Good points, Xan. And you obviously know what you’re talking about, since your paintings of animals are wonderful. I hope everyone visits your site to admire your work and get inspired. Hi,my name is lisa and I am working on a zebra head paper mache project. 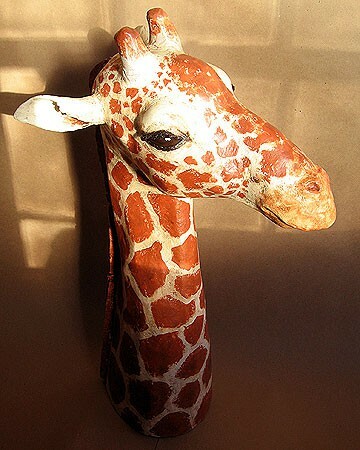 I have been struggling for years to get the smiling lips,ears.eyes,nose,and the brow that sits above the eyes,I see you have mastered all the above on your girraffe sculpture,can you help me tackle these problems? thank you. Hi Lisa. I struggled with those things too – I just don’t show photos of all the messy bits when I have to cut things off and start over. The eyes nose and brow of any animal, including us, will be determined by the skull. I’ve been seriously thinking about doing a horse head project, like your zebra, and start out with the skull. I’d need to find photos online of horse skulls, but there seem to be lots out there. An alternative is to use drawings in art books for models. And I’d do a lot of measuring to avoid the frustration of working for hours on an expression only to discover that I’ve put the eyes in the wrong place, which seems to happen a lot. Once the underlying bony form is in place, you can then add the eyeball and cover the top and bottom of it with eyelids. The smile is more difficult, since you have to look at so many photos from so many angles to get the expression right. We are wanting to make a giraffe head and neck for decorations for a class at youth camp. WE are using a jungle theme and all the classes have a different animal and we are showcasing the giraffe. Can you give us directions and maybe even some pictures of this process. Yours is absolutely gorgeous. Our camp is the last week in June, so we would need the directions and hints as soon as possible. We are crafty but not professionals. Thank you! Hi Rachele. I went through my photos and found enough to make a new post on how to make a giraffe, which you can see here. I hope it helps you with your camp project. (My giraffe took about two weeks to finish, but I think it could be done faster now that I have a better understanding of the process). i’m really glad i found this site.. been surfing for paper mache projects..
How true. I actually believe that the need to create and build things – whether it’s art or tools or buildings or whatever – is an innate human need. It’s one of the things that makes us human, in fact. In today’s world, very few people ever have the opportunity to make things with their hands – things that begin as images in their minds, and then become reality after long, enjoyable work. How many of us have low-grade generalized anxiety that has no apparent cause, but is really the result of sitting in an office all day, and then coming home to veg in front of the TV? Maybe that ‘void’ you talk about is more common than we think.